For 2019, our Many Glacier corral is scheduled to be open from June 8th through September 15th, weather dependent. We offer daily trail rides that last one hour. Times and locations change daily based on availability of horses and wranglers. This awesome trail heads out along the shores of Lake Sherburne and on to Cracker Flats, where the old mining town of Altyn once stood at the turn of the century. On the flats, you’ll get 360 degree views of all the mountains surrounding the Many Glacier Valley as well as great opportunities to see wildlife! This scenic two hour ride is offered in the morning only. This picturesque horseback ride takes you down the first few miles of the Piegan Trail. As you ride along the heavily forested trail, you’ll catch glimpses of Swiftcurrent Lake, Josephine Lake and the Garden Wall. Keep your eyes peeled for trickling waterfalls and curious animals along the mountain side. This two hour ride is offered in the afternoon only. 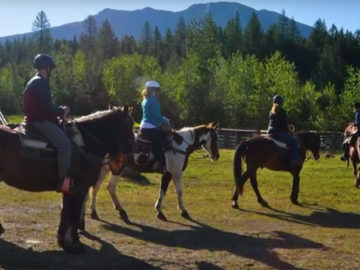 A full day experience in the Many Glacier Valley Check in at the Many Glacier Corral at 7:45am for the Cracker Flats two hour trail ride (see detailed description of the ride above). You will finish up with the ride at 10:30am which leaves you plenty of time to grab lunch and explore a bit of the Many Glacier Valley. 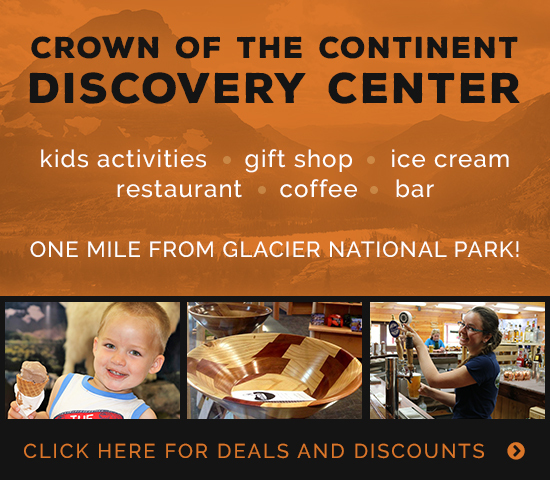 Enjoy a leisurely sit-down lunch at either the historic Many Glacier hotel or ‘Nells at Swiftcurrent Motor Inn followed by a stroll on the Swiftcurrent Nature trail before checking in for the 3:00pm boat tour behind the Many Glacier Hotel. The 3:00pm tour allows time for Glacier Park Boat Company’s famed hike between Swiftcurrent and Josephine Lake. For the go-get-er types, you can pack a lunch and hike to Apikuni Falls, Ptarmigan Falls or Redrock Falls before checking in for the 4:30pm boat tour behind the Many Glacier Hotel. A half day experience in the Many Glacier Valley Check in at the Many Glacier Corral at 12:45pm for the Josephine Lake two hour trail ride (see detailed description of the ride above). You will finish up with the ride by 3:30pm giving time to walk down to the Glacier Park Boat Company ticket office behind the Many Glacier Hotel to check in for your 4:30pm scenic boat tour. These packages are offered from July 1st through September 15th for a total price of $107.50 for guests ages 13 and older and $93.75 for guests ages 8 to 12 years old. Please note that reservations are required. This morning half day ride takes you through aspen and lodgepole forest providing a birds-eye view of Josephine Lake and picture-perfect glimpses of glacier-carved mountains and waterfalls. The horse trail ends at the trail head for Lower Grinnell Lake. At this point riders can dismount and walk the remaining quarter mile to the beautiful aquamarine glacial lake for a quick picture before heading back on the horses to the corral. This afternoon half day ride takes you along the historic stringing trail which meanders through the Many Glacier Hotel complex and down along Swiftcurrent Falls until you cross the Many Glacier Road and start climbing the ravine alongside Poia Mountain. Halfway up, at the Swiftcurrent Ridge hitching rail, you’ll dismount to get a great view over Lake Sherburne and the entire Many Glacier Valley. Then, you’ll head back down the mountain the way you came up, this time with the backdrop of the Many Glacier Hotel spanning before you. From the Many Glacier Corral, we are permitted to take guests to either Cracker Lake or to Poia Lake for a full day day ride. Beginning in 2017, the National Park Service is mandating equal use across these two trail systems. These requirements are being implemented to manage impacts from horses on high-use trails. As a result, it is not possible to choose which trail to go on. The destination of our full day ride will be chosen each day by Swan Mountain staff at the Many Glacier corral based on what current use numbers are for that week. The Cracker Lake trail takes you out along the shores of Lake Sherburne and up along Canyon Creek until you reach the striking turquoise waters of Cracker Lake. The ride is packed full of majestic views of the surrounding mountains and good opportunities to see wildlife, especially bears. Please note that this trail ride is not offered every day. The Poia Lake trail is chock-full of panoramic views of the entire Swiftcurrent Valley as we ride up and over Swiftcurrent Ridge. In one glance, you can take in thousands of years of geological history spread out before you. Once we reach the top, we will wind down along Kennedy Creek to the untouched Poia Lake where you will be swept away by the perfect silence of Mother Nature. Please note that this trail ride is not offered every day. Check-in time @ 8:00 am; trail offered varies and is chosen by Swan Mountain. Check-in times @ 7:45 am, 10:15 am, 12:45 pm & 3:00 pm. Saturdays and Sundays only. Check-in time @ 8:00 am. Check-in time @ 8:30 am. Note: the weight limit for this ride is 200 pounds. Check-in times @ 8:15am, 11:15am, 1:15pm & 3:30pm. Check-in times @ 7:45am, 10:15am, 12:45pm & 3:00pm. 4 person minimum. Check-in time @ 7:45am. Great ride at Apgar! The wranglers were awesome! Perfect for our kids' first horseback riding experience. Thank you!